Manchester United and FC Barcelona will meet in the pitch once again to reclaim the previous glory of being the #1 football club in Europe. Being previous champions of the prestigious UEFA Champions League, both club, Manchester United and FC Barcelona, for sure will treat us an intense final match for the 2011 UEFA Champions League Cup. Passion to win the Cup will drive both teams to strive hard and give all that they've got! This will also be the chance for Manchester United to avenge their loss to FC Barcelona last 2009 UEFA Champions League. For FC Barcelona, this will be a match to show that they're the best club in Europe. Both teams are great and a force to be reckoned with when it comes to football! I think no one can disapprove that. 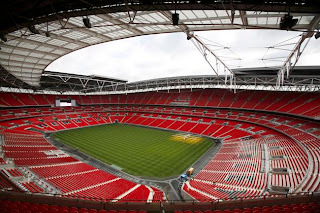 The FINAL MATCH for the 2011 UEFA CHAMPIONS LEAGUE is scheduled on May 28, 2011 at Wembley Stadium in London. I'm a Manchester United fan!! So, GLORY! GLORY! MAN. UNITED!!! It just gives me the chill and I can't wait for the FINAL MATCH! I'm excited for that game too!